This feature is only available with “silver” and “gold” plans. AFS Analytics allows you to automatically generate PDF documents containing all the analysis and statistics of your website. . 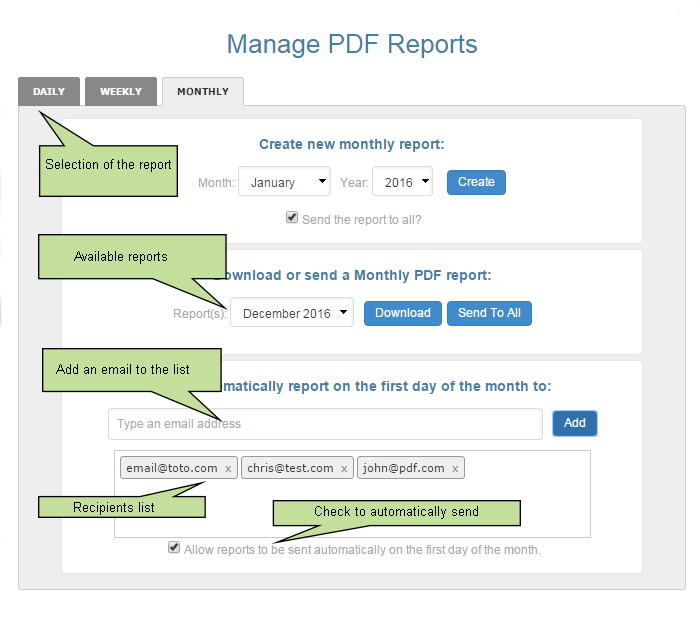 These PDF reports can then be automatically sent to several members of your team, each day, week or month. 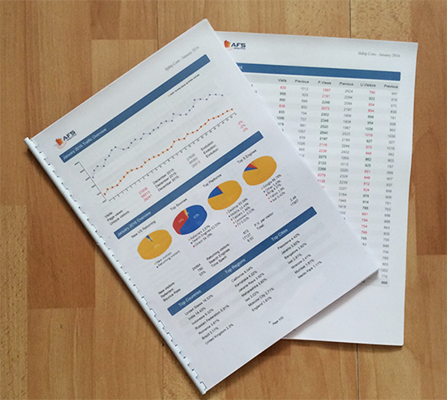 See an example of a monthly PDF report generated by AFS Analytics. Additional income for website developers. For web agencies or professional web developers, this useful option allows their clients to regularly receive detailed analysis on the evolution, traffic and performance of their website in a PDF file. We offer discounts or substantial commissions for resellers of our “SILVER” and “GOLD” plans. Don’t hesitate to contact us if you wish to generate additional income. 1. First, choose the type of report (daily, weekly or monthly). 2. In the ‘Create new report‘ form, choose the report period. 3. Click on the ‘Create’ button. If the ‘Send the report to all’ box is checked, the PDF document will be sent to all the email addresses entered in the ‘Allow reports to be sent automatically…’ field. Note: The report is not immediately available, its generation can take up to an hour. 4. Once available, the report will appear in the ‘Download or send a PDF report’ section. You will then be able to download it or send it to all the registered emails. 1. To get started, choose the type of report (daily, weekly or monthly). 2. in the ‘Type an email address’ field, type the address of the person who should receive the report and click ‘Add’. 3. Repeat #2 for every other person the report should be sent to. 4. Check the ‘Allow reports to be sent automatically …’ box.